So I’m in my new home now and it’s slightly up into the Port Hills. This means a speedy ride downhill at the start of the day, but a little bit of a climb at the end (only 400m of riding, mind you). It’s been ~15 years since I lived on a hill (in Wellington) and since then I’ve been relatively untroubled by serious gradients. But my new locale got me thinking about this topic. The other thing that people forget about hills is that “what goes up must come down”. Cycling on the flat is all very well but you have to pedal all the time. Contrast with a hilly place where, for half of the time, you can just cruise downhill without any effort. After grinding your way up a hill, I can tell you that it’s a really nice reward to be able to freewheel down the other side! And of course most modern bikes have these great things called gears. They’re not just there for decoration and, if you’ve never had occasion to really need your low gears around town, you’ll be grateful for them when you encounter a decent climb. Even if you don’t consider yourself particularly athletic, you’ll probably be able to putter along up most hills using your lowest “granny gears” (and no doubt get fitter over time in the process). Do you prefer to stay on the flat? Or do hills add some “interest” to your ride? I actually walk my bike up the Huntsbury walking track on the other side of the hill on the way home which stretches out my hamstrings. 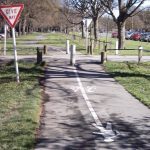 The Riccarton ‘hump’ is one of the places that would really benefit from having a couple of the flexible lane marker posts. It’s not uncommon to be ‘squeezed’ riding through there, or on the following left bend . The red bus company owes me a rim because of that section of road. I love hills. Here in Chch is kinda extreme – flat or mountain, nowt inbetween – as opposed to the rolling countryside that I used to traverse back in the UK. Electric bikes are another way to beat hills (or wind). And then there’s the Copenhagen Wheel (Google it – or follow: http://www.news.com.au/technology/gadgets/motor-of-copenhagen-wheel-installed-on-rear-bike-hub-kicks-in-to-give-cyclists-a-boost/story-fnda1lbo-1226786251288). This device “transforms almost any bicycle into an electric-hybrid vehicle using an app on a smartphone”. I haven’t seen one yet but it sounds and looks great! It’s not a free ride – you need to be pedalling to get the boost. I reckon the odd bit of an electric boost from time to time is likely to transform cycling so that it is more accessible to many more people. “More people cycling more often” can have a whole lot more relevance.